In this tutorial you will learn how you to build and setup a home or small office network and connect it to the Internet. Do You Build a wired or Wireless Network? Early (pre 2008) home networks were predominately wired networks. Wired networks use Ethernet over UTP cable and tend to be faster than wireless networks, which is an important consideration if you are a gamer. 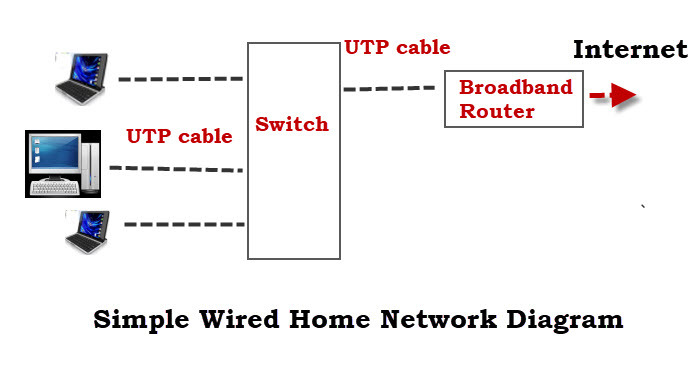 The simple wired home network diagram below shows a minimum setup with a switch and broadband router. Doesn’t work with devices that don’t have an Ethernet port e.g. tablets and smart phones. Not so easy and fast to setup as it requires running cables. However Homeplug or powerline adapters can be used instead. Not so easy for visitors and mobile devices (laptops) to connect to. Used for network backbone i.e. connecting between router,network switches and wireless access points on different levels (floors). Wireless networks use Wi-Fi. and are quick and easy to install, but are generally slower than wired networks. See Wi-Fi and Wireless networks for more details. Easy to setup from an end user perspective. Allows easy access to smart phones, Tablets and mobile devices. Not as Secure as wired networks without proper configuration. and easy to setup insecurely. Not so as fast as wired networks. Not as reliable as wired networks. Connecting peripheral devices like computers,smart phone,tablets etc. Most home networks will use a mixture of wired and wireless. Today however most home and small home office networks will use a wireless network or mixed network, as most people use Smart phones, and tablets which don’t have Ethernet support. Router or Wireless router – Connects the network to the Internet. Wireless Access Point – Used to Connect Wi-Fi equipped devices to the network. Ethernet HUB or Switch -Used to Connect Ethernet equipped devices. Cable cat 5, cat5e or cat 6 with RJ45 connectors. Telephone Cable with RJ 10 connectors. For most home networks the Wireless Router or Hub which connects the network to the Internet will be the main component of the home or small office network, and in many cases the only component. The Wireless router usually incorporates a Wireless access point,Ethernet switch, DSL modem and Router in a single box. This short video shows how to use a Wireless Home Hub ( BT) or router to create a home network that is connected to the Internet. DSL Modem– converts digital signals into analogue signals that are suitable for sending over a telephone line. It is usually built into the Internet/broadband router and is not normally purchased as a separate component. DSL/Broadband Filter– Used to filter out DSL signals from telephone signals so that you can access the internet and use the telephone simultaneously. The Wireless router will need to connect to the telephone line, cable or fibre network access point in your home. Therefore most people locate the Wireless router near to the main telephone socket. However you can usually change the location by using telephone extension cables or longer WAN cables. Note: WAN cables use the same connectors (RJ45) and cables as Ethernet cables. Because the Wireless Router provides the Wireless access point then you should place it in a central location, if possible, to get the best wireless reception. The easiest way of testing you signal strength in various locations is to use the inSSIDer Wi-Fi checker which is an App that you can install on your Android Tablet or phone. The general idea is to place the Wireless router in its preferred location and then move around the house with the inSSIDer Wi-Fi checker, and check the signal strength, and then adjust the location if necessary. In large homes/offices it may not be possible to connect all devices directly to the Wireless router and so you will need to purchase additional networking components. extending your Wi-Fi coverage by installing additional Wireless Access Points or a more powerful access point. To administer the router you access it via a web browser, and login using a username and password. Before you allow devices to connect to your home network you should make some basic changes to the default setup parameters of your router. The two important one are the SSID used to access the Router and the router admin password as the default username/passwords are well known, and published on the Internet. See How to Setup and Configure your Home Router and Setting up a secure wi-fi home network. The standard way of connecting a Wi-fi device to a Wi-fi network is the connect to the network and enter the password when prompted. However most modern Wi-Fi routers/hubs support a feature called WPS ( Wi-fi protected setup). Which usually involves pressing a button on the wi_fi router and a corresponding WPS connection button on the Device. All of your devices will need an IP address. This is provided automatically by a service called DHCP which, by default, is provided by the home router. IP address provided by the DHCP server are known as dynamic address as they can change. You can also assign addresses manually, and these are known as static addresses. Static Addresses are not normally assigned but are often required when using Port forwarding. Additionally the addresses used on your home network are known as internal addresses. When you connect to the Internet your device will use an external IP address. This address is the IP address of the router/hub. See Internal vs external IP addresses for a more detailed explanation. The main tool you use is the ipconfig (windows) or ifconfig (linux) tool. Your home router is your gateway to the Internet. When viewing your configuration some devices refer to it as the default router whereas other use the term default gateway. 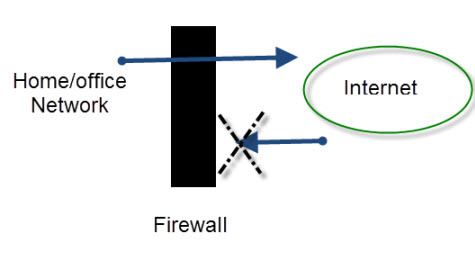 A Firewall functions like a router, and generally what you use on small networks is firewall/NAT router combination in which a single device acts as a NAT router and firewall. A firewall protects your home or small business network computers and devices from intruders on the Internet. For small home/office networks the firewall is built into, and is part of, the router that connects to the Internet. Generally there is no configuration required as the default behaviour is only to allow connections from the local network to the Internet, and not from the Internet to the home network. However if you do require devices on the Internet to connect into your network (often required by gamers) then you can configure port forwarding. You may also want or need to use dynamic DNS- see What is Dynamic DNS ? and Why Use Dynamic DNS Services? On any network the speed is restricted by the slowest component. A computer with a Gigabit network card talking to a computer with a 100Mbit/s network card is restricted to 100Mbit/s. Shared devices like switches and Wireless access points are network choke points just like traffic lights and roundabouts on a road. LAN Speed test is a very useful tool for testing your local network speeds. For Internet speeds you can use online speed test sites. See Understanding Internet speeds and speed tests. You will invariably have connection problems from time to time. In my experience most problems are easily diagnosed and fixed with a little patience and perseverance. Having a good understanding of how your network fits together, and works is essential for successful troubleshooting. If you have a home networking related question then just use the ask-steve page. Wi-fi Networks are easier to setup than Wired Networks? Wi-fi Networks are much faster than Wired Networks? You are getting a Bad Wi-Fi signal is some parts of your home What can you try to solve the problem? 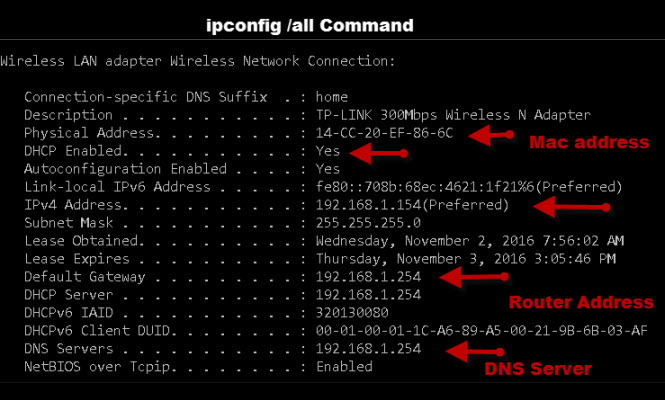 How do devices on a home network normally get an IP Address? They get them automatically from a DHCP server on the home router. On Most Home Networks the DHCP service is provided by which device? A Wireless Home router usually has Ethernet ports and a Wireless Access point built it? What device do you use between a ADSL router and the Phone connection? Where Should you Place your Wireless home Router? You must install and setup a DNS server to Access the Internet? I am a beginner in networking and I am learning the basics. The article is written in such a lucid way that every beginner will understand the working principle quickly. The author has done a great work. I have a work computer and a home laptop. The work computer is wired to my router and a line to my wall. I use wifi on my laptop. I have one modem/router for both. Is my connection for home use private or can my company access my interaction on my laptop since I know they can pop onto my screen to see what I do on the work computer. What sort of networking would I need to have to prevent them from joining onto my personal laptop? I would assume that the company installed software on the work computer to allow them to access it remotely. You should’t have any on your personal laptop unless you installed it and so you should be Ok with a normal home network. The UTP cable is probably the connection to the phone socket which is common with ADSL and Fibre connections. If you have cable or fibre to the home then this is usually a coax cable. I have a wired (Ethernet) home network which was installed at least 10 years ago. We were able to share files, printers etc on 3 laptops around the home We had a very good internet service to manage the network. It identified any additional hardware and installed it into the system. However, it was bought out by Corel some years ago and closed down! Nothing similar that I could find has appeared since. Now with Windows 10 eliminating Home Group we have so far been unable to set up a replacement network. Windows instructions for sharing on a home network are complex to say the least! So what now? Do I need to uninstall the remnants of the old network and install some thing new? What is it? Perhaps there is a programme somewhere like the one described above? Going wireless is not an easy option because of interfering structures in the home. Thanks for any advice. You didn’t say what the service was called that you used. I wasn’t a big fan of home group I think they messed networking up after windows XP. On my home network I share printers and folders on different windows machines and Linux machines using Windows networking. To make it easy you need to create a user account with the same name and password on each machine and if you can be as open as possible (use everyone) when sharing as it makes it easier. The difficult part with sharing is security so just be careful what you share. Once you are setup and it is working then you can change it to make it more secure if you need to. Thank you for your good advice. I can’t recall the name of the service sorry. A problem of age and memory! I’ll have a shot at the steps you suggest. It is possible to plug the digital phone cord into a ethernet switch, will the phone signal and the internet signal work together? I haven’t worked with IP phones. But from what I understand they don’t connect to you normal telephone exchange but to an IP exchange and so the phone signal and Ethernet signal don’t exist together. I use two laptops, one a primary for everyday use, the other a secondary for backup purposes. Both have Ubuntu Linux as their operating system. I can use both to access the Internet via the router/modem provided by the ISP, either simultaneously or separately, but I have never been able to get them to “see” each other. There does not seem to be a way in Ubuntu to view the “elements” of a network. I would like to synchronize files between the two but cannot at present do this. I found out about an application called “rsync” that should accomplish this in the Linux terminal but I don’t know the commands and syntax to use, particularly as the two laptops seem to be invisible to each other. I have facilitated file sharing in the relevant folder of the secondary laptop. There is a status page from the ISP that shows the ISP addresses that have been allocated but I don’t know how to use these addresses in rsync. The whole situation is confusing me. Can you help in any way? You should be able to ping each machine from the other one. use ifconfig to get the ip address of each machine and do ping ipaddress from each machine. It should work. If that doesn’t work the it may be easier to install samba on each machine and use that. You have a great website. I like how you cover most important networking concepts and components in a clear and concise manner. I disagree with question 4 on the quiz. Configuring your DNS server correctly Is an Important part of setting up a Home Network to connect to the Internet? 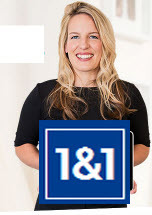 If your computer does not have at least one proper DNS IP address configured, it cannot connect to the internet.